First, a list. 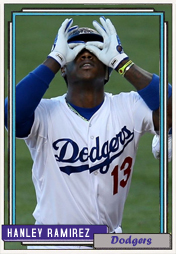 The Dodgers acquired Hanley Ramirez from the Marlins on July 25, 2012, just short of 23 months ago. Since then, adapted from Baseball Prospectus, here are the injuries he’s suffered that have required him to miss at least one game. Were I go to back to include his time with the Marlins, there would be an additional 26 instances of Ramirez missing at least one game, from items as minor as a game or two here and there for “soreness” or “contusion” — and, to be fair, no one expects a player to get into all 162 games over a long grinding season — to major issues like left shoulder injury (52 games) and back inflammation (14 games), each coming in 2011. But then, this isn’t really about the latest ache. Corey Dickerson hit a rocket, it took a sharp bounce, and hit his finger squarely. That happens in a baseball game, and hopefully it won’t send Ramirez to the disabled list, because after his homer earlier in the game, he’s hitting .277/.375/.494 over the last month. It may not always feel like he’s producing, but he is, with a wRC+ of 129 that’s identical to his career marks. The problem is about what these continued dings and dents mean for his future. Ramirez is a free agent after the 2014 season, and talks about an extension haven’t yet led anywhere. The Dodgers need him back, because Erisbel Arruebarrena (who was not in today’s Albuquerque starting lineup) has a long way to go to prove he can hit in the big leagues and Corey Seager isn’t out of A-ball yet. There’s not an internal option, and even if you go out and get a J.J. Hardy or someone to play short, Ramirez is best served as a third baseman anyway. He seems supposedly okay with doing that, and the Dodgers aren’t likely to be low-balling him financially, so it’s pretty clear what the sticking point is: contract length. Ramirez turns 31 in December. I’m fine with overpaying a bit annually to keep him around for the next few years. I’m absolutely terrified of giving him a long-term deal, and that’s probably what he wants. The last we heard about this situation was a few weeks ago, when Jon Heyman reported that Ramirez’ camp wanted something in the $130m range. Take all that with a grain of salt — remember the rumor that Nelson Cruz not only received but turned down five years and $75m this winter? — but if true, that’d likely be something just north of $25m per year over five years, or just over $21m for six. For annual value, that’s not unreasonable for a player of Ramirez’ skills. There’s also a case to be made, I believe, that the right solution is to simply do nothing at all. After all, Ramirez isn’t a free agent this winter, and there’s reason to believe that there’s absolutely no way he performs in 2014 like he has in 2013, plus you collect more information on if he can really stay healthy. You’re arguably going after him at the peak of his value right now, and that usually ends a lot better for the player than it does the team. It’s not entirely unlikely to think that having him at one year and $16m and still having the option to let him walk after next season if he can’t stay healthy or happy or productive is the best course of action, because you’ll still have the chance to lock him up next summer if you like — though the team may not agree. That’s basically what’s happened. We’re learning more about Ramirez, and what we’ve learned is that health is always going to be an issue (he’s played in 218 of 298 regular season games), and that he’s absolutely not a shortstop long-term. I said that at the high end, I could live with four years and around $100m, though at the time I envisioned including 2014 in that. Even though including 2014 is no longer an option, I would still be okay with that, locking up Ramirez for his age 31-34 seasons. The problem is that Ramirez and his agents almost certainly want to guarantee payment for his age-35 and -36 seasons based on the player he is now, not the player he’s likely to be then. I don’t really want Ramirez to be the Dodger shortstop in 2015; I’m not sure I want him to be the Dodger third baseman in 2020, either. I’m hopeful that there’s a happy medium in there, somewhere. Presumably, we’ll find out in the next few months.